It came out as a surprise in 1992 and promised to bring Formula 1 performance to a road car. And it succeeded. As in Formula 1 the driver is positioned at the centre of the vehicle but what McLaren F1 did was add two more seats at the sides. At the time of the incarnation no other sports car could match its performance due to powerful engine and light body. Rear positioned mid engine was provided by BMW. It was a 6.2 litre V12 powerhouse. Chasis is pure carbon fibre reinforced structure. Aluminium was used all around and had to be delivered to shows using a specially made carrier. That made a car lightweight and agile on both the road and race track. Due to only 106 cars built it became highly collectible and desirable and is today one of the modern icons of British automotive industry. 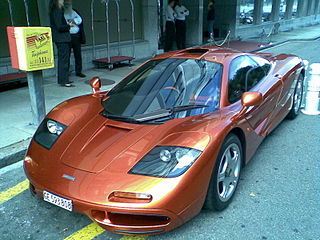 Even today, McLaren F1 is one of the five top performing cars in the world.